The Transportation Capital Program for FY 2018 describes the planned capital investments for the State fiscal year starting July 1, 2017. It represents the annual element of the New Jersey Department of Transportation’s and NJ Transit’s federal Statewide Transportation Improvement Program (STIP). Focusing on the department’s Core Mission—safety, infrastructure preservation, mass transit, mobility and congestion relief, and operations and maintenance—this Capital Program outlines projects and programs that rebuild the State’s bridges and roads, provide mass transit services, and reduce congestion by deploying Intelligent Transportation Systems (ITS) technology. This Capital Program reflects the need to prioritize spending in a difficult economic environment by carefully evaluating transportation needs and targeting limited resources toward safety, fix-it-first and state-of-good-repair initiatives. The FY 2018 Transportation Capital Program totals $3.669 billion and is funded primarily by the State Transportation Trust Fund (TTF), federal, and third-party resources. 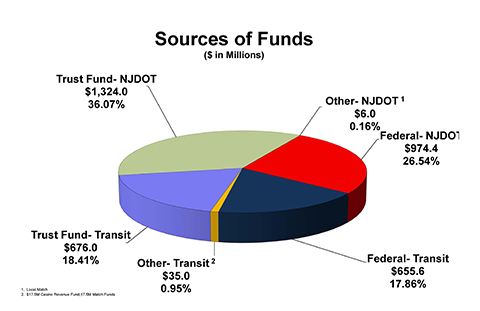 The NJDOT total is $2.302 billion and the NJ Transit total is $1.367 billion. State, or TTF funds, are programmed at $2.000 billion. Federal revenues for FY 2018 are projected at $1.623 billion. NJDOT’s share of the federal funding is $974.4 million, while NJ Transit’s allotment is $655.6 million. The NJDOT program provides $506 million for state and local bridges. Bridge investments range from funding for high-cost bridges to implementation of a variety of rehabilitation programs and local bridge rehabilitations. The NJDOT program provides $491 million dedicated to road assets, including pavement rehabilitation, reconstruction and resurfacing. The NJDOT program provides $103 million for safety improvements. Key programs funded include the Crash Reduction Program, Intersection Improvement Program, Pedestrian Safety Initiatives, Rail-Highway Grade Crossings, and Safe Routes to School Program. The NJDOT program provides $315 million in funds to address highway congestion through infrastructure improvements as well as efforts to better manage traffic and respond to incidents. The NJDOT program provides $54 million for multimodal investments that support maritime, freight, and rail initiatives as well as bicycle and pedestrian improvements. The program budget allots funds to address NJ Transit’s state-of-good-repair needs, debt service obligations, preventive maintenance and local programs. The program continues to provide funding to support ongoing track replacement, bridge and tunnel inspections and improvements, security improvements, signal system upgrades, overhead power line and electric substation upgrades, replacement of buses in NJ Transit’s fleet, and other rail station and bus terminal improvements throughout New Jersey. Local System Support totals $701 million. NJDOT totals $651 million in federal and state funded local system support. This amount includes $430 million in State Local Aid: $322.5 million State Aid Program for municipalities and counties; $47.3 million to Local Bridge Future Needs; $30 million for the newly created Local Freight Impact Fund; and $30 million to Local Aid Infrastructure Fund. NJ Transit’s local support totals $50 million. Additionally, funds for programs such as Local Safety, High Risk Rural Roads, Safe Routes to School, and Culvert Inspection are programmed on the local system.